Give your heart a break (from the cholesterol!) by choosing to grill meat rather than frying. It's much healthier plus with proper kitchenware, it doesn't need to be a hassle! We'll show you how with this Beef skewer BBQ recipe. 1. Combine all the ingredients for the marinade in a large mixing bowl. Set aside. 2. Slice meat and transfer to the marinade, stirring well to coat the meat generously. Marinate for at least 1 hour or over night. The longer, the better. 3. After marinating the meat, slice veggies and skewer them with meat. 4. 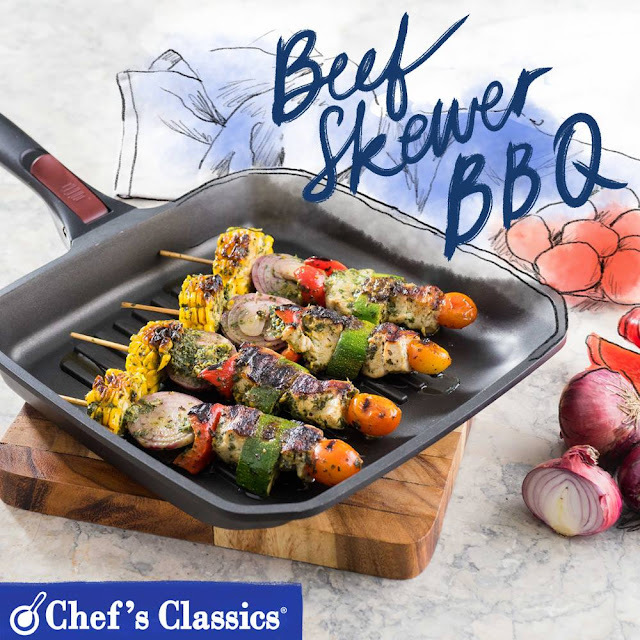 Heat Chef's Classics Caper Grill Pan, and grill the skewers. 5. Brush occasionally with the remaining marinade. 6. Grill the skewers for 4 minutes each side until both sides are cooked. 7. Serve with Java rice.